PRODUCT RATING There are many reusable take-out coffee cups on the market, but the keepcup looks good and works well. It’s easy to use and very easy to clean. It feels good in your hand and against your lips (I hate the feel of those cheap disposable plastic lids against my lips). It is not waterproof, so don’t toss it in your bag when full. It’s not insulated like a thermos. It is a well designed, superior replacement for the plague of single-use cups. GREEN RATING Deep Green. Over the course of a year, using a reusable cup instead of a disposable one, reduces landfill waste by at least 99%, and reduces greenhouse gas emissions and water use by up to 90% (water is used to make paper). Every minute, 1 million disposable cups are discarded to landfills globally. Most paper coffee cups are lined with plastic, so are NOT recyclable. Many coffee shops, especially the chains, now serve their coffee in disposable cups regardless of whether you sit-in or take-out. When I attended HKU as an exchange student in 1998, there was a cafe/bistro that served its food and drinks in ceramic and glass ware (and was staffed by disabled people). It has now been replaced by a Starbucks that primarily uses disposable ware. Without waste disposal charges, it is cheaper for them to give us a disposable cup than to pay for a dish washer. As responsible consumers, we need to request a ceramic cup when sitting-in or bring our own cup when taking-out. Most disposable cups are lined with polyethylene, which makes them NON-recyclable. EPD recycling guidelines specifically direct us NOT to recycle paper cups. This means they end up in the landfill after the 15 minutes it takes most of us to drink a cup of coffee. Annually 500 billion disposable cups are manufactured around the world; that’s about 75 disposable cups for every single person on the planet. Using a reusable cup is not only the right thing to do for the planet, but also provides us with a superior experience. The keepcup feels solid in your hand and the lid/spout seals nicely against your lips when drinking. You can rotate the tab to close the spout and throw it in your bag when finished drinking. While it’s not completely waterproof, it is significantly more spill-proof than a disposable cup. The cup disassembles for easy cleaning. The nicely rounded edges make it easy to wash. The keepcup has ml/oz markers on the inside so the barista can correctly measure the right amount of coffee. Some environmentally irresponsible outlets such as fuel espresso in IFC still insist on first pouring their coffee into a disposable cup before pouring it into your reusable cup, thereby completely defeating the purpose of bringing your own cup. Fortunately, there are so many great coffee shops in Hong Kong, we as consumers can chose to frequent the more environmentally responsible ones. 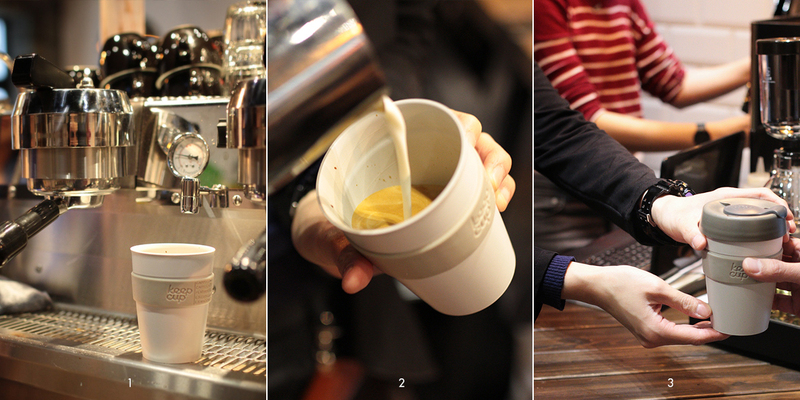 No matter which cup you choose, we encourage you to try bringing your own cup the next time you buy a beverage to go. Your guilt-free coffee will taste so much better. You are so right. phantastic article. I do not understand why it is still acceptable to use single use cups when there are facilities to offer a ceramic cup. I really think someone should develop a pocketable, foldable, reusable, washable beverage container. Summer is hot here and we are just too easy to go in 7-Eleven or Circle K for a bottled drink. Instead can they install beverage fountain for the foldable beverage container? Totally agree with you.. Many coffee shops now serve their coffee in disposable cup. Nice writing, enjoyed Reading it.